Endoscopic ablation for esophageal early squamous cell neoplasia – can we predict success and recurrence? Esophageal squamous cell carcinoma is the eighth most common cause of cancer worldwide, with the highest incidence seen extending from East Africa, through the Middle East, and onwards to China . It is the sixth most common cause of cancer death. Therefore, any intervention at an early stage of disease is desirable. The past decade has seen an overwhelming shift towards organ preservation with endoscopic eradication therapy (EET) for early esophageal neoplasia. High disease eradication rates are reported with accurate lesion staging and resection by endoscopic mucosal resection (EMR)/endoscopic submucosal dissection (ESD), followed by field ablation with radiofrequency ablation (RFA) for disease confined to the mucosa and superficial submucosa. These data have been focused on patients with Barrett’s esophagus (BE)-related neoplasia. 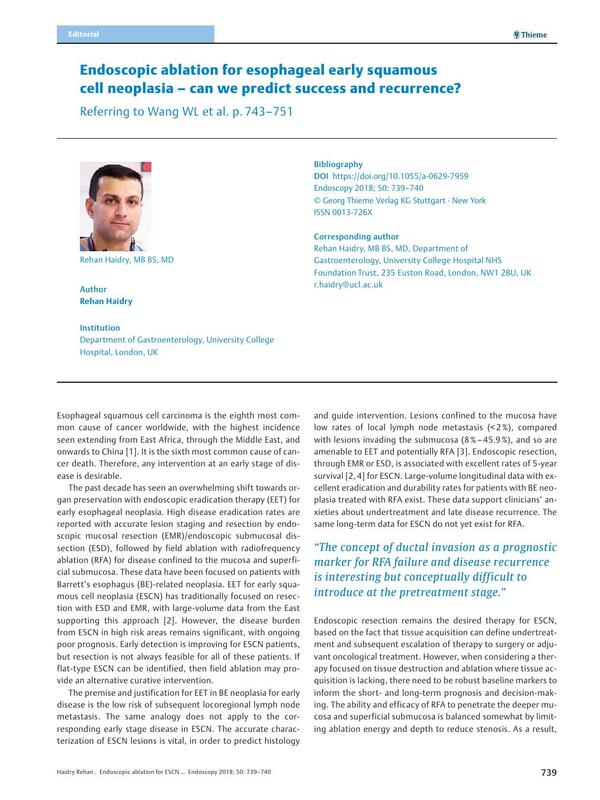 EET for early squamous cell neoplasia (ESCN) has traditionally focused on resection with ESD and EMR, with large-volume data from the East supporting this approach . However, the disease burden from ESCN in high risk areas remains significant, with ongoing poor prognosis. Early detection is improving for ESCN patients, but resection is not always feasible for all of these patients. If flat-type ESCN can be identified, then field ablation may provide an alternative curative intervention. The premise and justification for EET in BE neoplasia for early disease is the low risk of subsequent locoregional lymph node metastasis. The same analogy does not apply to the corresponding early stage disease in ESCN. The accurate characterization of ESCN lesions is vital, in order to predict histology and guide intervention. Lesions confined to the mucosa have low rates of local lymph node metastasis (< 2 %), compared with lesions invading the submucosa (8 % – 45.9 %), and so are amenable to EET and potentially RFA . Endoscopic resection, through EMR or ESD, is associated with excellent rates of 5-year survival   for ESCN. Large-volume longitudinal data with excellent eradication and durability rates for patients with BE neoplasia treated with RFA exist. These data support clinicians’ anxieties about undertreatment and late disease recurrence. The same long-term data for ESCN do not yet exist for RFA. Endoscopic resection remains the desired therapy for ESCN, based on the fact that tissue acquisition can define undertreatment and subsequent escalation of therapy to surgery or adjuvant oncological treatment. However, when considering a therapy focused on tissue destruction and ablation where tissue acquisition is lacking, there need to be robust baseline markers to inform the short- and long-term prognosis and decision-making. The ability and efficacy of RFA to penetrate the deeper mucosa and superficial submucosa is balanced somewhat by limiting ablation energy and depth to reduce stenosis. As a result, RFA for ESCN has been used only sparingly with indifferent outcomes in the short and medium term   . These studies of RFA have examined patients with “truly early disease,” with flat-type Paris 0-IIb lesions and meticulous endoscopic staging and imaging prior to RFA. Even with this approach, experienced endoscopists can underestimate the depth of invasion, as shown in the study by Jansen et al. where experts underestimated disease severity when assessing ESCN lesions for RFA. They demonstrated that one-third of flat-type ESCN deemed eligible for RFA demonstrated histological features that were considered contraindications to EET. In the study by Wang et al. reported in this journal , from a tertiary center with vast experience in delivering RFA for patients with ESCN, the authors examined and evaluated the short- and long-term treatment outcomes of 35 patients with ESCN undergoing RFA. All patients had flat-type (0-IIb) lesions. Imaging with endoscopic ultrasound (EUS) and magnifying endoscopy ensured there was no suspicion of deeper invasion. After sequential and successful RFA had been performed, they looked to identify risk factors for tumor recurrence and determine whether buried ESCNs within esophageal ducts exist in recurrent or persistent ESCNs after initially successful RFA therapy. They reported a success rate of 30/35 (86 %) at 12 months in terms of disease eradication after RFA treatment. These eradication rates are impressive and on a par with the previously reported data from this group  and historic data from China  . At a mean follow-up of 40.1 months in the 30 patients with successful eradication after RFA, six patients (20 %) developed a total of seven local esophageal recurrences. Although this is a high recurrence rate, all lesions were successfully resected endoscopically. They report a novel finding of ductal invasion in these recurrences as a potential prognostic indicator. Six recurrences (86 %) had ductal invasion, all of which extended deeper than the muscularis mucosae layer. Immunohistochemical staining for P53 and Ki67 suggested a clonal relationship between ductal invasion and epithelial cells. No cases of cancer buried beneath the normal neosquamous epithelium were found. In the study by Jansen et al. , the presence of esophageal ducts was found in up to 25 % of resected ESCN specimens. They also showed in the lesions deemed appropriate for RFA that at least half (53 %) of subsequently resected specimens showed extension of neoplastic epithelium into the ducts. The concept of ductal invasion as a prognostic marker for RFA failure and disease recurrence is interesting but conceptually difficult to introduce at the pretreatment stage. The study by Wang et al. is the second such series to describe this concept. Other than pathological assessment of the resected specimen, there remains no robust method to detect ductal invasion and its prevalence in the successfully treated post-RFA neosquamous disease-free esophagus is unknown. With the concept of 3D “in vivo” endoscopic diagnosis with volumetric laser endomicroscopy (VLE) and confocal laser endomicroscopy (CLE) still looking for a clinically relevant indication in the treatment of esophageal neoplasia, detecting ductal invasion prior to field ablation may be an interesting avenue to pursue to understand the relevance of this novel finding. Furthermore, we are limited with RFA in terms of the depth of tissue destruction because of the high stenosis rates seen in patients with ESCN. Growing interest in cryotherapy for ESCN may allow us to potentially target deeper neoplastic tissue hidden in esophageal ducts to reduce recurrence and data will surface in the coming years.